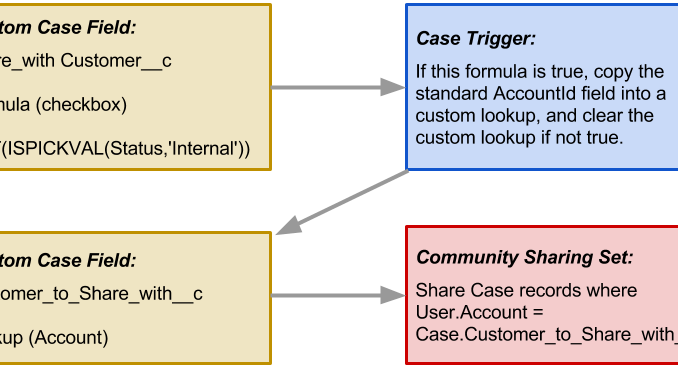 I have explained in a previous post the sharing-related differences between Customer Community licenses (or Customer Community Login licenses) and Customer Community Plus licenses. If you are leveraging the non-plus variety, you may have to get slightly creative with your approach. To achieve “super user” like access, again, check out that previous post. I learned that (as documented) the formula does indeed seem to be updated at the time you access Trigger.New. If you are messing with fields in the trigger that are included in your formula, you may need to call the SObject.recalculateFormulas() method. However, beware that this method can’t be used if you are using cross object references. The cool part is that once you have this set up, you can change your criteria in the formula field without the need to deploy a change to your code. thanks for this solution it works great, I can confirm that the use of a process flow works so 0% coding required. great option for a sensitive issue.